Home › HIV News › (Red) Rush To Zero! Buy stuff…end AIDS. A little oversimplistic, but you get the idea. Hey! Do you like stuff? Do you want to reduce the number of HIV infections globally and locally? Well then, how would you like to have your stuff and eat…it…too? No, that doesn’t work. What about how would you like to reduce your cake to zero? You know what, screw the cake metaphor! 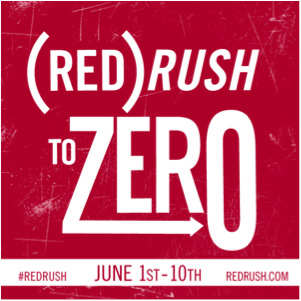 There are still 4 days left in the (Red) Rush to Zero, where being a rabid capitalist can help save lives. In the mood for a Quintuple Chocolate Latte with Caramel Drizzle? I don’t know if that drink actually exists, but if you go to Starbucks and check in on FourSquare while drinking it, then Starbucks will donate $1 up to $250,000! And with four days left, they’ve already committed to donating $176k, so I think we can reach our target if we get really caffeinated. So, embrace your inner glutton for a couple days for a good cause. And when someone asks you why you’re buying an entire case of Penfolds Koonunga Hill, you can tell them that it is not in fact because you’re a lush, but because they’re donating 15% of all purchases to help end HIV.